I really wanted to make risotto yesterday, but didn’t have Aborio rice. I had a ton of Basmati rice. 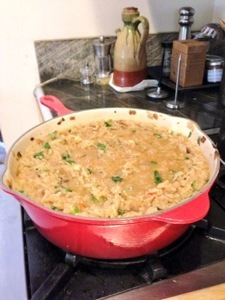 So, I decided to see what would happen if I made long grain Basmati in the nature of a risotto. I used black truffle butter with a little white truffle oil and caramelized a medium red onion. I then added about a head of chopped garlic, and a small red pepper I found in my produce basket, chopped fine. (I forgot the name of the little, round, red pepper, but it was spicy!) I added a bit more butter and oil and added the Basmati rice. I tossed it so it was covered in butter and oil and let it toast slightly to exude a nutty, floral aroma. After a few minutes I added a good amount of cream sherry. The pot bubbled and the rice sucked up the sherry. When the pot was nearly dry, I added about a cup of homemade chicken stock I had simmering on the back burner and stirred. As the pot would nearly go dry, I would add more chicken stock. I don’t know how much rice I used, probably a couple of cups. And I used a lot of stock. I just eyed it. Toward the end I added a good amount of chopped flat leaf parsley. I kept adding stock and stirring until the rice was al dente. It took about a half hour. I seasoned it with a little salt and tried some. It was sweet, spicy, delicious. What’s more, the Basmati rice kept it’s integrity. I was kind if hoping the stirring would break down the starch, but, it held up rather well to my surprise. It made for a moist rice. Not creamy, not mushy, just moist. I will actually make this experimental rice dish again. I’m going to make a chicken curry to serve with it today. Yum! So far, we’ve shared Foodspotting tips from restaurant professionals. All of their advice has been awesome, but we wanted to bring in a different kind of food-pro perspective for the third round of tips. Mee-Sun Yuk is the Senior Product Manager for iOS at OpenTable. When she isn’t working on the incredibly cool iOS 7 OpenTable app, Mee-Sun is cooking, eating and discovering all kinds of amazing dishes. Her passion for both technology & food shines through in her photography and in this set of tips. You can improve the quality of your food photos even before the food comes out. The best food photos benefit from more natural light, so I always request a table by a window if possible. Also, try to make sure you’re not sitting in between the light and your table, or you’ll end up with some shadowy shots. Remember that you’re not confined to your seat and your beeline view of the dish. Move your hand position with each photo you take to see what makes the food look the most delicious. It takes some practice with aim, but try raising your camera up and over dishes to get a birds’ eye view. Sometimes your friends may be impatient to start eating, so use it to your advantage. Get an action shot of how people interact with the dish – especially for dishes that you can really play with, like noodles or meat grilled at the table. A great way to get creative (and hungry!) 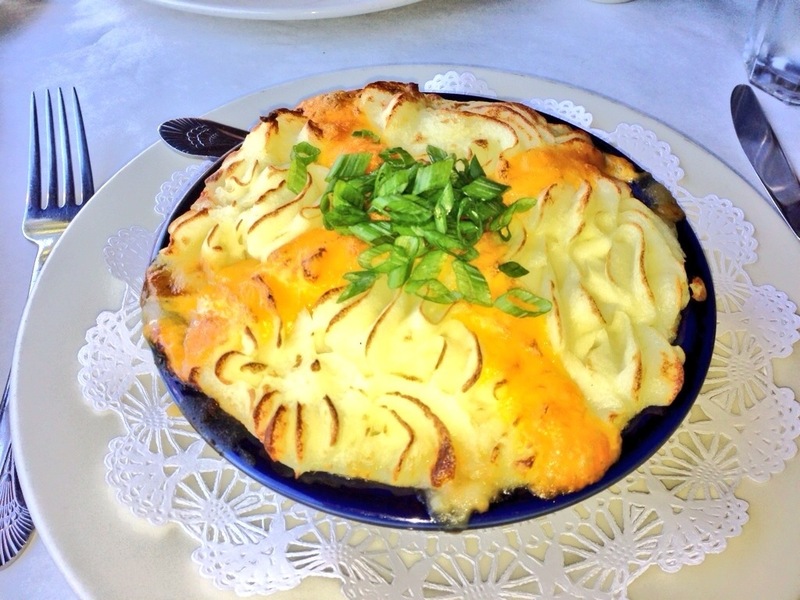 is to grab your fork and dive in. Focusing the camera on a close up bite brings a great contrast with the rest of the photo. It can also help you show more detail about the dish than you would normally. I’ll keep looking for tips on food photography and pass them along. By-the-way, I just installed the food spotting app on my phone and it’s pretty cool. I was cooking for a small dinner party last night and had two recipes in mind. We were having the get together at a friend’s house, so I had to cart all my ingredients over there. Needless to say, I forgot a couple of key ingredients which made me totally revamp the recipes. I used a tagine for the first time and a beautiful, huge cast iron skillet I received for my birthday. Originally I was going to make Carrot and Potato Tagine with Peas. Well, I forgot both the carrots and the peas. Ugh! My second dish was to be a Three Cheese Curried Cauliflower au Gratin. Except my dear friend, who only has one pot and one pan as she doesn’t cook, had no flour to thicken the cream sauce. Really, my friend? No flour? Okay, time to think quick on my feet…and I only had an hour before company was to arrive. First, I took out the butter. Double cream Devonshire butter, absolutely fantastic! I put the tagine on the fire, the large, cast iron skillet, the small pan my friend had, and her pot. Butter went into everything. (Not Paula Deen portions, mind you.) My friend washed off some small potatoes and chopped some shallots while I cut the cauliflower into florets and the butter began to melt. I chopped some garlic and gave it a couple of minutes in the butter. I added the cauliflower to the tagine and tossed it in the minimal butter and garlic. Then added a little organic chicken stock, just enough so there would be liquid in the tagine as the cauliflower steamed. What I noticed about the tagine, is the lid is perfect for capturing the steam and cooking whatever is in it without too much heat. I’m now in love with my tagine where I was once afraid to use it… I thought I’d crack it by putting it on direct flame, but that didn’t happen. With the cauliflower cooking, a added some more chopped garlic to a small pan, then after a few minutes, added shallots and let them caramelize which takes patience. Then I took the halved potatoes and covered them in cold water and added a vegetable bouillon. I let them boil until for tender, but not at all mushy as I wanted the potatoes and cauliflower to keep their shape so the dish didn’t look like mush. Next was the large skillet. After I melted a little butter, I added some Indian spices to the hot pan: cardamom seeds, fenugreek seeds, cumin, and turmeric, about a tablespoon of each. I stirred to allow the flavors to develop. The smell was intoxicating. My friend found some frozen carrots, string beans, peas, and corn. Why not, I figured. And I added them to the skillet with some vegetable bouillon and chicken stock. There were a lot of vegetables, so the salt content wasn’t too much. I tossed the veggies and let them gently simmer in the seasoned juice. Back to the cauliflower. It had steamed perfectly and with so much flavor from the chicken stock. I took it off the flame. Soon the potatoes were done and I drained them. And the shallots were caramelized beautifully. The liquid was reducing from the pan of vegetable sauce, so I added the shallots and the cauliflower with it’s juice. I then added some curry powder for a bit of added taste and color. I turned off the heat. I added the drained potatoes back to the pot with more butter and a good amount of chopped flat leaf parsley and put it aside. Lastly, I made a cheese sauce with three kind of cheese: Cantal, Emmental, and Parmigiano-Reggiano. I added two pints of heavy cream, and more butter to help it thicken. When the cheese melted and the sauce came together, I added it to the spiced vegetable mixture. The vegetables maintained their integrity so it had a nice array of textures, and I served the parsley potatoes on the side. I probably would have added the potatoes to the skillet as well, but had no more room. I don’t know what you would call this dish. To me, I made it in a whirlwind, so I dubbed it my “Crazy Curry”. Bottom line, it looked good, but smelled and tasted fabulous! Everyone went for seconds of both the curried vegetable mixture as well as the potatoes. It was a hit! My suggestion to making your own variation of this dish would be to make sure you use enough stock &/or bouillon, and butter. The cauliflower and potatoes need to absorb some salt. Next time I would make a roux and thicken the cheese sauce a bit. And, had I more time, I would have liked to have added curry leaves and some other spices in my repertoire. I’m so sorry I didn’t take a picture. I was in a hurry to get dinner on the table and had served everyone right away while everything was still hot. (Another plus of both the tagine and cast iron, they both maintain their heat.) When we had all dug in, my friend reminded me we didn’t take a picture. So, I guess I’ll just have to make it again… With pleasure. I’m at a loss for how to take photos of food with my phone while dining in a limited lighting, fine dining establishment. I was using the flash on my phone, but the photos came out overexposed. I’ve tried it without the flash and the photos are too dark. I’m trying to be somewhat discreet and don’t want every course to look like a photo shoot. What shall I do? I take photos, write blogs, post to twitter and Facebook all via my phone. Is there a way to solve this dilemma? Or, do I need to make the adjustments on my laptop? Also, how do I upload a picture to twitter from my iPhone? Anybody? What a wonderful way to end my birthday week. My party decided to go to Race Lane Restaurant on Race Lane in East Hampton. Terrific food, beautiful presentation, trained staff, thoughtful menu and wine list, and attention to detail were just some of the things that made this night a special experience. The ambiance was chic, comfortable, and romantic. The fireplace in the dining room is surrounded by seats to sit and take in the atmosphere and enjoy your company. The expansive bar allows for mingling, as well as the banquettes that line the lounge area. The host was attentive, personable, and on the ball. Some of us joined the rest of the party at the copper topped bar. We sat and had red wine all around before moving to our table. We were soon greeted by our waiter, Michael, who was very knowledgable about the menu. Without peeking at a note pad, as I often find waiters doing to remind them of the specials, Michael recited the specials in detail from memory, even answering intricate question about ingredients that comprised the specials. We ordered drinks and examined the versatile menu with raw bar. As soon as I spotted the foie gras appetizer, I knew I had to try it. Though I had foie gras recently off the American Hotel dinner menu, I wanted to make a comparison. The portion of foie gras was comparable, but I have to say, the ginger-pear chutney with brioche and vanilla became the clear winner, and for $8 less, may I add. I ate the chutney until there was no more on my plate; I couldn’t get enough. It was sweet but not overly sugary, and it had smooth and chunky textures which gave it good mouth feel in contrast to the melt in your mouth foie gras. 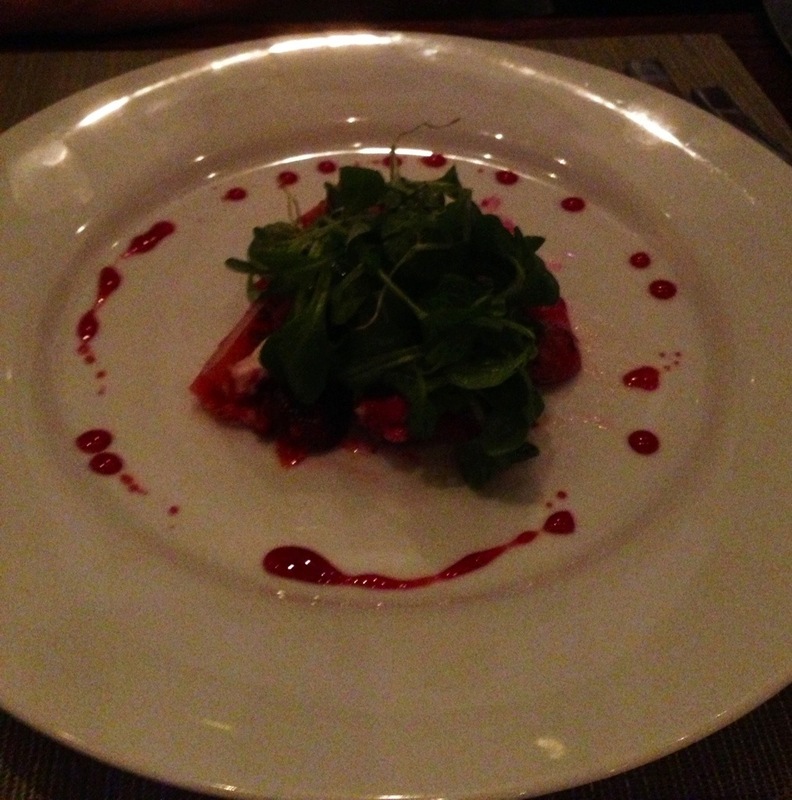 A friend tried the beet salad special. I can’t remember all the ingredients, but if you order it, know you’re in for a treat. There’s horseradish in the description, but I couldn’t detect the taste of horseradish. It was earthy with candied nuts and a touch of sweetness. The table wanted more. 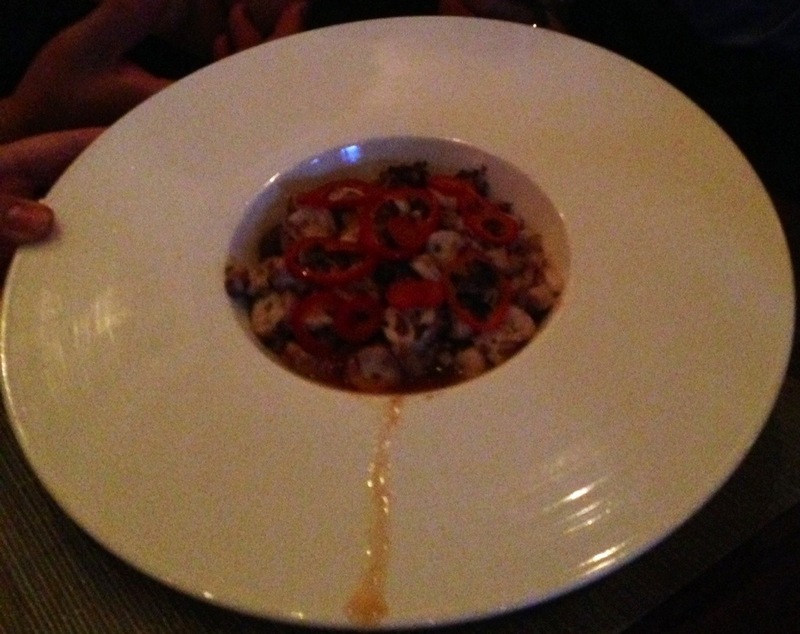 Another favorite appetizer was the octopus with tomato confit, kalamata olives, parsley and pickled red chili. The octopus was extremely tender, which made the dish. The combination of the confit, olives, and pickled chili played perfectly off each other to deliver a bit of a kick, but not to overpower the taste of the octopus. We all shared super fresh, local Montauk pearl oysters with cucumber mignonette and blood orange granita. Plump and simply delicious. The entrées that shined through as sure bets were the braised short ribs with baby carrots, beets, horseradish gremolata and potato; the grilled Berkshire pork chop with a bacon scallion pancake, zucchini, and cherry mustardo; and the special 14 ounce NY strip steak with caramelized cippolini with burgundy reduction and truffle butter, which we had prepared medium-rare. Some notes on the entrées: the short ribs were a bit too fatty for one of the diners and it was commented that the portion was small, two small short ribs. I agree it did look insufficient. In stark contrast, the Berkshire pork chop was huge, juicy, and very tasty. 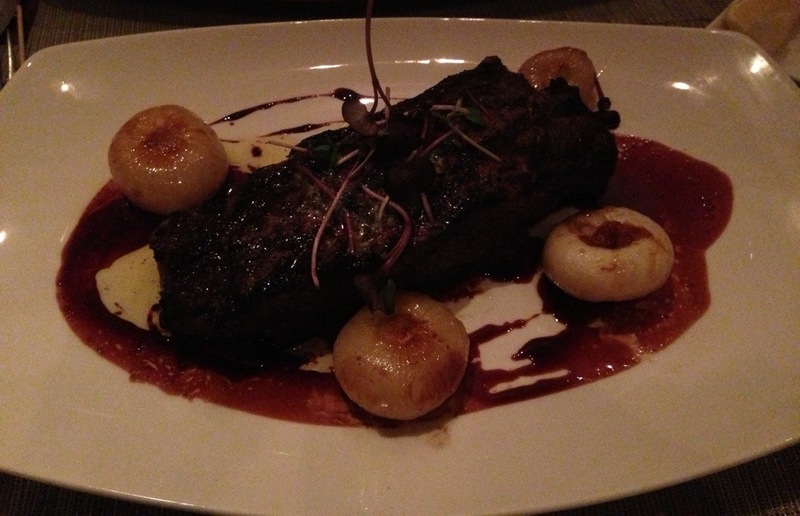 The best liked out of the three was the generously thick NY strip. It was agreed it wasn’t overly fatty, it was very tender, and through the sauce that adorned it, you could really taste that it was a good tasting cut of beef. For dessert we tried a little of everything. The strawberry shortcake was the standout winner. It looked so inviting, we all dug in without taking a picture first, so, I apologize for that. The strawberries were naturally sweet and fresh. The pound cake was light and airy. Each bite was savored by all. Thank goodness it was a good sized portion so everyone could have some. Overall, a well-paced, very tasty and versatile meal. No one was disappointed by any aspect of their culinary experience, save a couple of comments, and expectations going in were high. I highly recommend Race Lane for a special occasion or romantic evening for two. It’s trendy without being ostentatious, and the staff is very accommodating and pleasant. Some items are a bit pricey. But, with everything taken into account, the dining experience as a whole made it well worth the cost. Fresh Hamptons, simply known as “Fresh” is off of Main Street in Bridgehampon. I’ve heard of this restaurant throughout the summer, but never got around to going. Well, I didn’t know what I was missing. Now I do and I’m sure to be back. 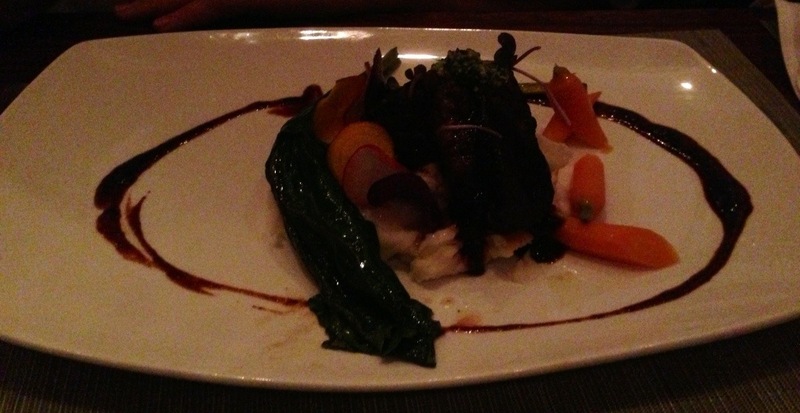 There were some bumps in the road with the staff along the way, but overall, it was an enjoyable dinner experience. The food, oh my gosh! The food is local when possible, in season, organic, and “fresh”. The menu is to salivate over if you like raw, vegan, vegetarian, gluten-free choices. Brilliantly, the chef, Todd Jacobs, has incorporated a wide array of seafood, a chicken dish, braised short ribs, steak, and duck into the menu. So, there’s something for everyone. Let’s start with the decor. I would call it rustic. It has a comfortable feel with an open floor plan arrangement. There are tables to accommodate larger parties at the ready, tables in the middle and across the side wall, and generously sized booths along the back wall. There’s enough space between the tables that you don’t feel you’re on top of the table next to you. I noticed there were no children throughout our three hour meal, but they do provide a children’s menu. The bar is inviting, though I think they overdid it with the Halloween decorations. We were greeted by a nice enough hostess and led to our booth. The first thing I noticed beyond decor was there seemed to be more staff than diners. A lot of staff was wondering around, seemingly, with not much to do. We sat, we waited… We waited. Then our waiter appeared. A young man from Mexico who shall remain nameless as not to embarrass him. He took our drink order. I was the designated driver, so I ordered a large bottle of Pellegrino with lemon and lime. 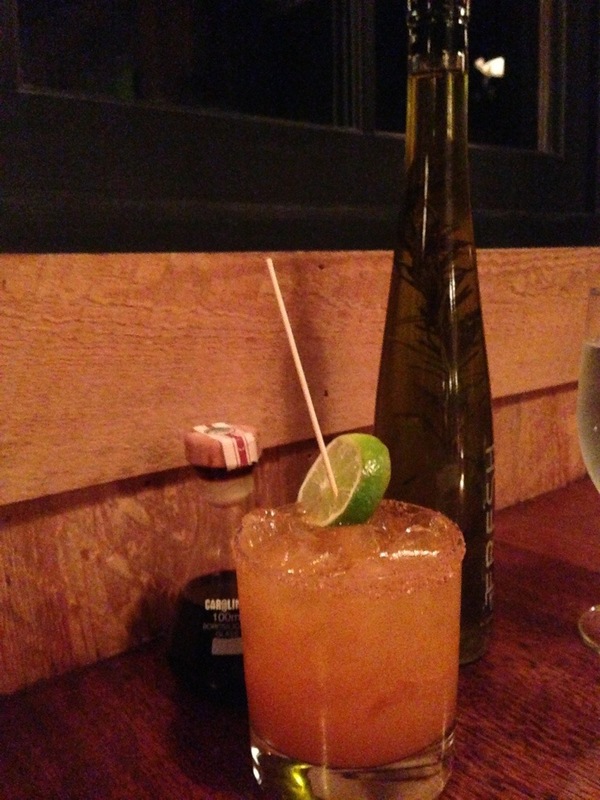 My friend ordered a specialty margarita called “the smashing pumpkin”, then my other friend ordered a glass of wine. Our drinks took a while to make it to the table. A lovely young woman brought them over and the waiter followed with a bottle of wine. He had removed the foil from the bottle before asking if this was the bottle we ordered. Rookie mistake. When he approached, my friend reminded him she had ordered a glass of wine, not a bottle. His face dropped. Apparently my friend had ordered a glass of wine off the bottles only side of the wine list. She wasn’t about to drink the bottle of wine herself, so asked he take it back and bring her a glass. We took another look at the wine list and saw the bottle the waiter partially opened was $135. We felt terrible, but from the waiter’s face, not as badly as he felt. My other dining partner made up for it somewhat with the $15 specialty margaritas. We were given printed out menus on clipboards, something different. There were several pages to study, and the menu has been cut down from the in season menu according to Chef Todd. I’m glad we were occupied with the menu as it took a good twenty minutes before another young woman came over with piping hot rolls. But, as with the rest of the meal, the quality and goodness of the food compensated for the slow service. The rolls must have come right out of the oven. They were crisp on the outside and soft on the inside. You had your choice of plain or multi-grain. No butter was served. So, we used the rosemary infused olive oil that was on the table for dipping. They also keep balsamic vinegar on the table, but no other condiments or salt or pepper. We were told the specials and continued to peruse the lengthy menu, with joy, may I add. We finally decided on some small plates to be able to try as many things as possible. Unfortunately, I wasn’t with a party of ten or so. There was so much on the menu I wanted to try I could hardly contain my excitement. We ordered a Thai dish: Thai green curry summer vegetables with basil, zucchini, eggplant, string beans, peppers, onions, tomatoes, spinach, green chili, coconut milk, and Thai basil. The first thing that awakens the senses is the smell. A spicy broth, as Thai curries are known for. The flavor was simple and well balanced. Again, it was spicy. But, the spice didn’t detract from the individual flavors of the vegetables. Next we tried the local, organic, Yukon potatoes roasted with duck cracklings, shallots and dill. The potatoes were very good, and they came with plenty of cracklings which was a treat. I believe a hit of salt would have been helpful. Next was the organic, whole grain red quinoa with local, organic tomatoes and fresh sage. A clean flavor with the tomatoes and sage, lending a burst of fresh flavor to the earthy red quinoa. This was followed by the oven roasted, local, organic butternut squash with Indian madras curry, caramelized onions and fennel pollen. This was my favorite. The squash was served in chunks that were fork tender, seasoned with the madras curry which is simply a spice and not a sauce as people often associate with curry. The squash was sweet and savory at the same time. It was not spicy. The onions were caramelized which added to the depth of flavor. We also ordered the crisp, baked, organic kale chips with olive oil and sea salt. My only complaint, they weren’t evenly seasoned. My first kale chip was super salty, yet I went back for more. Andrew Zimmern of Bizarre Foods fame on the Travel Channel suggests always trying things twice, two bites, whether you like it or not. So, I went back for another chip. No salt. Hmmm. I suppose I had enough of a lingering salt taste in my mouth to carry over to my second piece. They were nice and crispy, however. Thin and nearly melted in our mouths. Unfortunately, that was the only dish remaining with food on it when we were finished. The main meal, from order to finish, took about two hours. We had a lot of laughs, so, it was well paced for us. But, if I were in a hurry, I would have been frustrated. Here’s the inexperienced staff part, again. The waiter never asked anyone if they wanted a second drink. We waited patiently and ended up flagging him down. The bartender finally brought the drinks over. We finished the bottle of sparkling water, but was never asked if we’d like another. Flagging down the staff for missing items was a theme to the evening. And, the young woman with the rolls never asked if we wanted another while we were looking over the menu for close to a half hour. We had to ask. After finishing our meal, the food runner, who looked no older that 15-years old, offered us duck and another plate. Wrong table, we told him gently. The one thing we didn’t have to ask for was the dessert menu. The desserts were just as interesting and appetizing as the main menu. We had to order the crème brûlée. Cool, smooth custard with a warm, sugary, semi-burnt top which was, as my friend put it, the best crème brûlée she’s ever had. 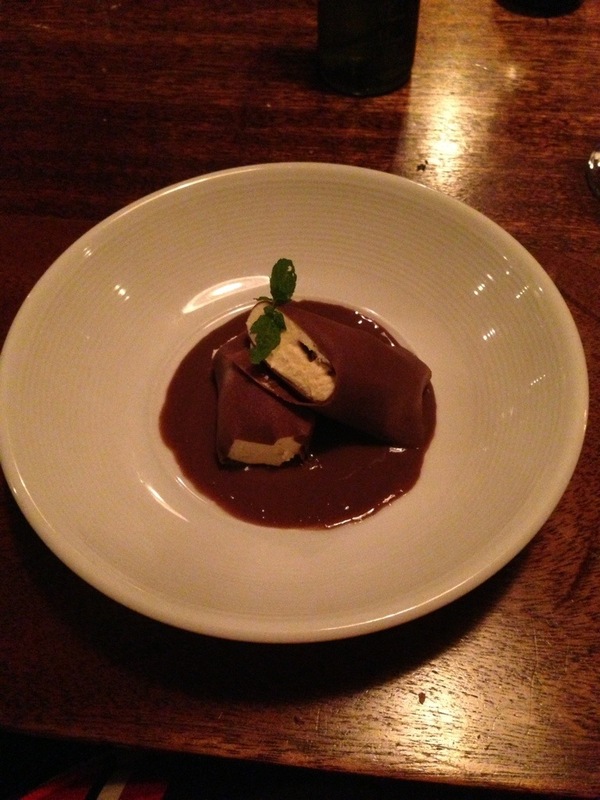 Then we shared the chocolate crépes with white chocolate mousse filling in a chocolate sauce garnished with fresh mint. For lack of a better expression, OMG! Velvety, thin crépes made of chocolate was genius. The white chocolate filling was slightly cool and refreshing against the chocolate sauce. Unlike my counterparts, I enjoy a little mint with each bite. It made the dessert. I haven’t had a dessert this delicious and well executed since I can remember. It was worth waiting for. Oh yes, the waiter forgot to put in the order for the crépes, but apologized and brought them out fairly quickly. I’m including a picture of the chocolate crépes, but the picture doesn’t express the play on textures and flavors. It’s a sure winner. There was so much on the menu we were too full to try. So, I’ll go back to try the more hearty dishes like the whole roasted fish and many more. Please look over the menu as it would take forever to describe each dish. The braised short ribs with five spice and merlot wine will likely be on the next order, as well as the Long Island duck. I’m bringing more people next time. The restaurant offers themed week night specials. Family Night Sundays is a $59 per family dinner package. Serves 2-4 adults or 2 adults and 2 kids. Manly Mondays from 8-10pm at the bar offers a grass fed beef burger or grilled veggie burger and Blue Point draught beer for $10. Taco Tuesdays is served family style and priced at $19 per adult, $10 for children under 12. Wine Down Wednesdays offers any bottle of wine under $100 for half price. World Cuisine Thursdays offers a three course authentic dinner from different parts of the world for $34 per person. I think I may try a Thursday night sometime. Chef Todd is so creative, I look forward to what surprises he has in store. When we were through with everything, Chef Todd appeared in the dining room and made his way to some of the tables to assess our experience. We expressed our happiness with the meal and menu. He has a humble demeanor and thanked us for our feedback. We decided not to mention the front of the house issues. We didn’t want to take away from what was, overall, a wonderful culinary experience. Shortly after, we were approached by a white-haired woman, dressed in nothing special, who asked us how our dinner was without introducing herself. We couldn’t express our disappointment with the front of the house as we had no idea who she was and left before we could ask her. If she’s the front of the house manager, she has some work to do and she wasn’t present in the dining room until closing. The next time I go, I’ll be sure to seek her out. We flagged down the waiter for the bill. It was reasonable, save the $15 specialty drinks which I thought was a few dollars overpriced. But, I suppose, that’s where they make a good part of their money. The waiter just needs to learn to build up the check with drinks. I can definitely see myself going back for more. I recommend this restaurant if you have patience, and don’t mind looking like you’re trying to land a plane on the runway with your arm flailing in the air for the better part of your meal. The food far supersedes the inexperienced staff. Kudos to Chef Todd for bringing his talent, experience, and mouth watering fare to another, hopefully, successful restaurant. This may be my most challenging, yet rewarding, posts I’ve written. 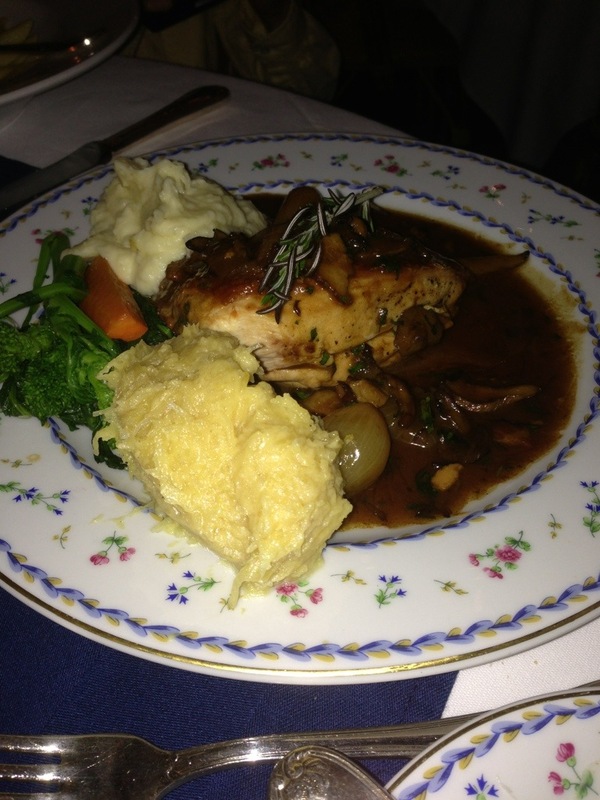 The American Hotel is one of the finest restaurants on the east end of Long Island. It’s won numerous awards for their extensive wine list and many mentions as being the cream of the crop of high-end restaurants in the Hamptons. Most consider Sag Harbor part of the Hamptons, while a few stick to the notion that if it doesn’t have “Hampton” in the name, it’s an un-Hampton. From my experience, Sag Harbor is a bit more artsy, laid back, and less expensive in some respects compared to, say, East Hampton. But, it’s still a Hampton to me. What makes Sag Harbor especially appealing is it’s waterfront. You can dine from several restaurants and look at the yachts and sailboats in the harbor. It’s truly a beautiful place. That said, let’s move from once whaling town to present day Sag Harbor. There’s a great number of terrific restaurants worth naming in this town and, little by little, I hope to tell you about each one. But my favorite, hands down, is the American Hotel. For years, the American Hotel has been a south fork favorite. I could write page after page as to why this is such a terrific dining experience. But, I’ll try to curb my enthusiasm and keep it down to a few paragraphs. But please, check out the various links in this blog to learn more about this establishment and it’s chef, Jonathan Parker. The American Hotel was my choice of restaurant for my birthday dinner last night. We had an attentive staff of four, and our waiter was Dennis. Service was tops. Unobtrusive, yet always available and very knowledgable. We were kindly greeted, seated, and attended to right away. We sat in the garden room, slightly away from the bustling bar crowd. It was beautifully decorated with exposed brick, greenhouse roof, plants galore and lighting reminiscent of Christmas. It’s definitely cozy and inviting with white linen table cloths, polished silver, candles and fresh roses on each table. The dinner menu is a pleasure to read. Additionally, our waiter told us of five specials in great detail. The funny part was when my seven year old opened the backlit menu and was amazed by the light. None of us had seen a menu like this before. The waiter, Dennis, laughed stating that someday the menus will be interactive and there will be no more need for waiters. It reminded me of something out of Harry Potter. 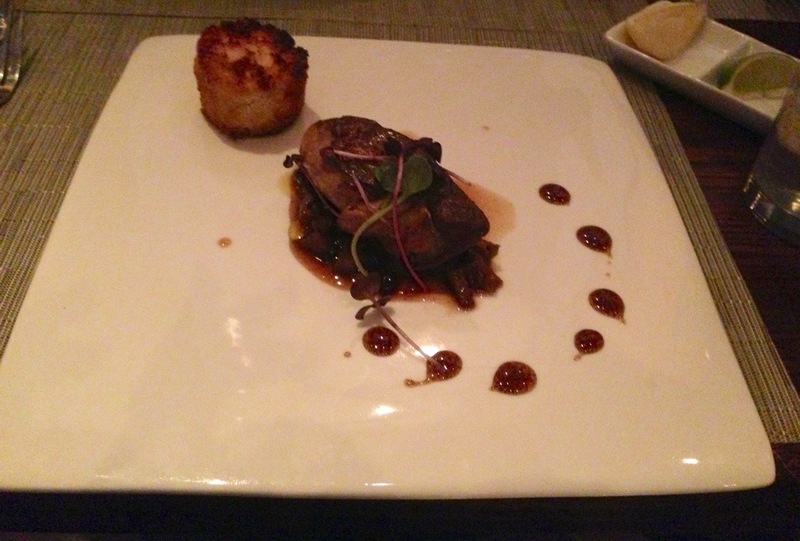 Anyway, from our beautiful menus we ordered the foie gras sauté potro blanca, $28. It was a good portion of foie gras as I try it whenever it’s on the menu. It was a large piece on toasted points in a grape reduction. The flavors blended perfectly. I think my eyes closed in pure bliss after I savored every bite that just melted in my mouth. I was tempted to get the soupe a l’oignon gratinée. An onion soup topped with gryère cheese and, I believe, sage croutons. Yum! But, I had to go with the foie gras. My husband had the colossal shrimp cocktail. They don’t call it colossal, but five-count jumbo shrimp cocktail served with cocktail sauce and a citrus mayonnaise, $19. 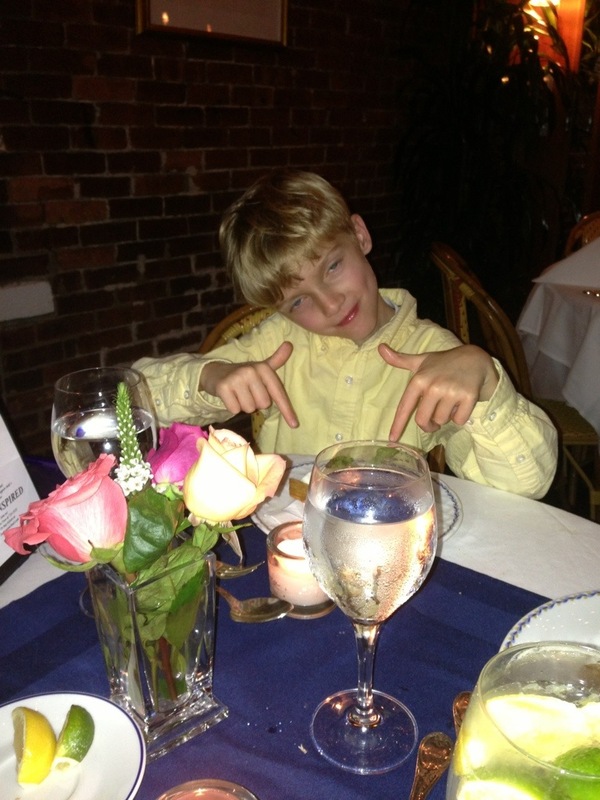 Our seven year old son ordered the penne pasta with butter from the children’s menu, $18, which was an adult portion size. He ate well and there was still another meal left over. We all enjoyed the warm Tuscan-like bread, salted breadsticks, and spreadable butter. If you’re with a party of four or more, I’d suggest getting the plateau deluxe with caviars for $150. This spread of seafood and caviar is one of my favorites. If they’re still serving it the way they did the last time I had it, the food was served on tiers and made quite the optical impression, in addition to tantalizing one’s taste buds. I was tempted to get the sautéed sea scallops with fall squash and truffle risotto, $38, as I’m a sucker for good risotto. But I’d just had a similar squash risotto at The North Fork Table and Inn the night before. 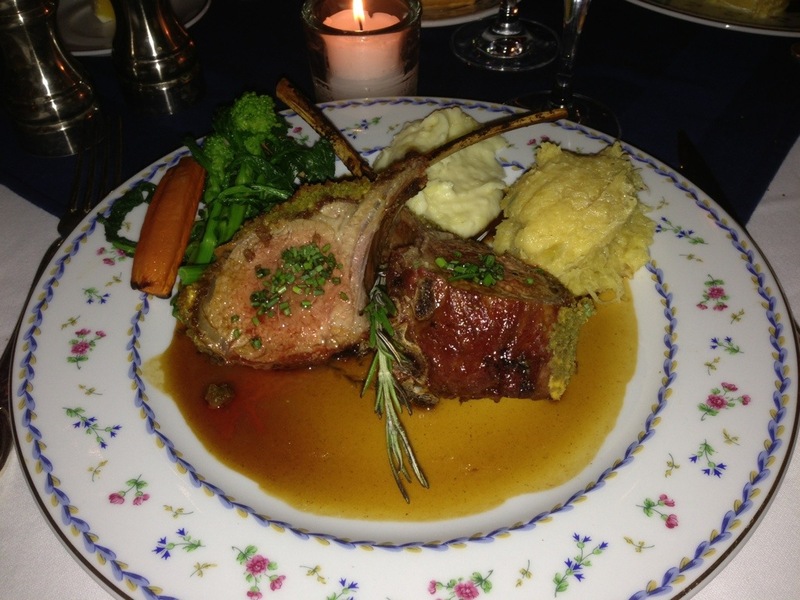 So, I went with the outstanding double cut rack of Australian lamb, $44. You receive two double rib portions along with mashed potatoes that were well seasoned, broccoli rabe, and a purée of root vegetables. The lamb was herb crusted with what tasted like salt, pepper, rosemary, and perhaps a touch of horseradish. My husband had the savory breast of organic, free-range chicken done in a mushroom and bacon drizzle with the same sides, $31. It was moist and full of flavor. There was also a tempting two-pound lobster on the menu and a vegetarian risotto. For dessert I ended with a perfectly made decaf cappuccino. My husband ordered the warm apple tart in puff pastry with homemade vanilla ice cream and caramel sauce, $15, and my son had vanilla ice cream as well, $13. 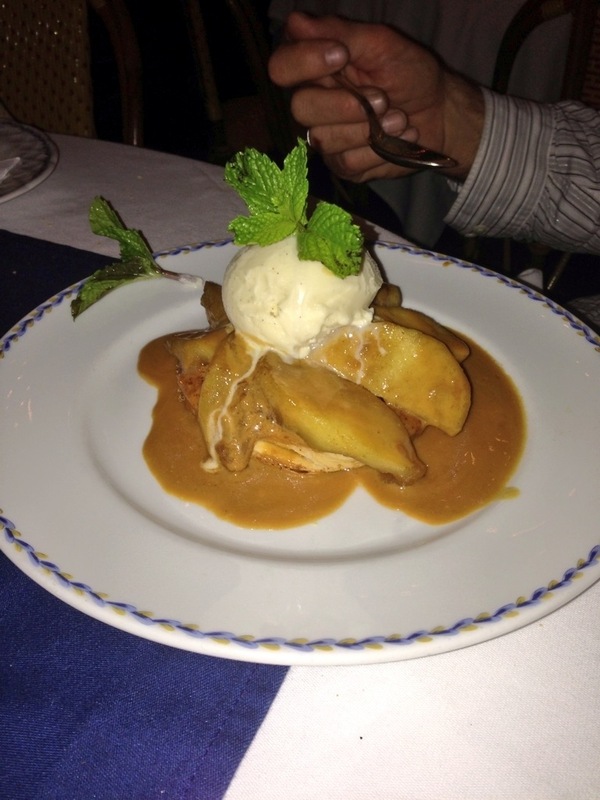 Had I an appetite, I would have ordered one of my favorites, the bananas foster! As you can see, the prices aren’t outlandish. You get plenty culinary delights for a fair Hamptons price for a restaurant of this caliber. I don’t know if what I’m about to write is either good or bad, but the award winning wine list begs you to order a bottle of wine, which can easily set you back $60 plus dollars. Then there are the after dinner drinks. A single snifter of cognac, of superior quality of course, could cost you $80. Depending on the size of your party, your beverage bill can far surpass your food bill. My motto in this wonderful environment, go big or go home. It’s well worth every penny. Hi, everyone! If you’d like to catch little excerpts about what I’m up to, feel free to join me on twitter @kimhamptoneats. Bobby Van’s Steakhouse in Bridgehampton is a real winner. Today, for my birthday, my lunch companion and I chose Bobby Van’s for their consistently good food, inviting atmosphere, professional staff, and reasonable prices. Being a beautiful autumn day in the Hamptons, we decided to dine outside. Service was at the ready. As we were short on time, we skipped over appetizers and went right to the entrées. I had the Shepherd’s Pie. Beautiful to look at and a hearty portion. It was a simple combination of meat and peas covered with mashed potatoes and sprinkled with cheese and scallions. It was piping hot when it came to the table. As I unveiled what lie under the potatoes, I discovered a meaty, juicy, tasty mixture. Peas and carrots were obvious, but I can’t be sure if there were onions in it or not. I saw a touch of celery which I enjoy. If there were onions, they enhanced the flavor and weren’t at all readily noticeable. I thought I saw a piece of corn, but saw no other evidence of corn. It was pure comfort food, of which I maybe ate a third. 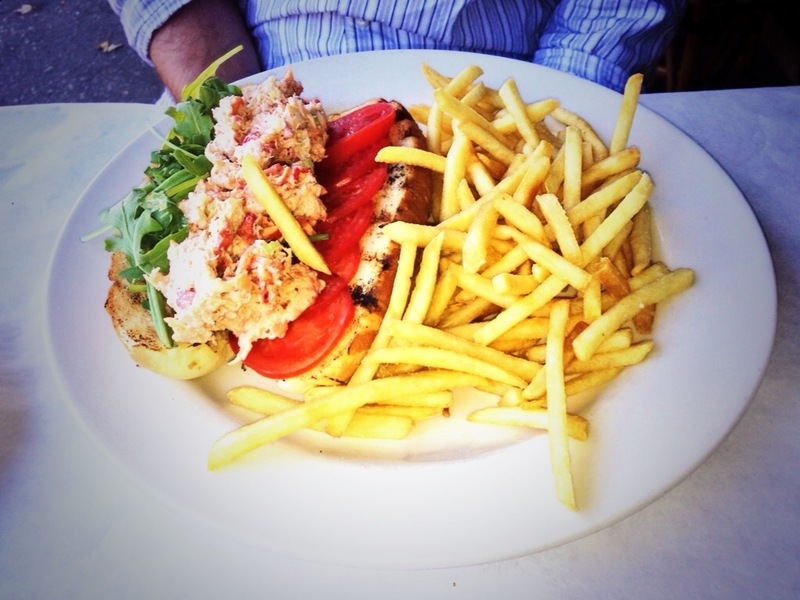 My lunch date had a colossal lobster salad that was fresh and sweet and not overdressed with mayonnaise. It was served with greens on a hot dog-like roll, but longer and definitely tastier. Again, a good portion of food prepared well. The shoestring French fries were crispy and nicely salted. There’s so much more to say about Bobby Van’s. Their menu is well thought out and prepared to perfection. I’ve never had a bad meal nor bad service there. I just love the straight forward food that makes you feel you’re getting a good bang for your buck. The next time I go to Bobby Van’s, I’ll be sure to go over the menu for you. In the meantime, take a look at their menu and, if you’d like, leave me a suggestion of what you’d like me to sample as I believe I’ll be going back with friends next week. A great steakhouse and rival of The Palm. Okay, my blog is about the goings on in the Hamptons. However, I have to tell you about this restaurant on the north fork that’s really come into it’s own, the North Fork Table & Inn in Southold. It’s one of the best restaurants on the twin forks. My birthday is tomorrow and that means I get a couple of days of enjoying my favorite restaurants around the clock. The North Fork Table & Inn is my choice for this evening. Go to their website and take a look at what they’re offering and sign up for their emails for specials. Tonight I’ll be taking advantage of their early bird price fixed offer. Via email, I see the North Fork Table is offering a three course price fixed dinner for only $45 per person. My dinner party will go with the wine pairing for an additional $30 or so. I’ll let you know for sure when we order. This special is only offered on the slower nights of the week between 5-6:30. Even if, with wine pairing, it turns out to be $75 per person, in my experience it’s well worth it. I once went for a seven course price fixed meal with wine pairing, but it was simply too much food. The price was high ($125 per person plus $30 for wine pairing), but the food was out of this world and arguably worth the cost. I recommend trying it once for the experience. Having spent part of my life on the north fork, I have a soft spot for it. The open farm land, the numerous farm stands, the beautiful and award winning vineyards, to some of the best grass fed beef, free range poultry, and farm raised organic produce you can put your hands on. The North Fork Table is known for taking these farm fresh ingredients and using them regularly in their restaurant. On one hand it’s elegant food, yet unpretentious. On the other hand it’s upscale comfort food. This is a sure bet, no regrets, restaurant experience. I’ll be sure to tell you all about the experience later this evening or tomorrow. I’m really looking forward to tonight. Now that I’ve decided where to go tonight, I’ll have to decide where to go tomorrow in the Hamptons. Nick & Toni’s, the East Hampton Grill, The Palm, The American Hotel… We’ll have to look to see what’s on the menu. UPDATE: I had a wonderful dinner at the North Fork Table last night. But, they must have made a mistake in their email. It wasn’t $45 per person for a three course meal, but $75. It was still worth it to me. But, the service was a touch slower than the last time I was there, and there was a screaming child in the dining room. That’s not the restaurant’s fault. But, it was off putting. It’s not a restaurant for small children. When we were first seated, it took several minutes to be approached to see what kind of water we wanted: flat, tap, sparkling. We were presented with menus and the price fixed options were described: three courses for $75 or seven courses for $125, with wine pairing an extra $30. What struck us as odd is no one asked us for a drink order until we were ready to order. They have an extensive wine list. We decided to choose our own wines. The Lenz 2010 Merlot was especially bold and earthy with a full bouquet. I believe The Lenz Merlot won some awards for their 2010. Suffice it to say, by the time the wine arrived, we were all thirsty! For a first course we tried the autumn cheese pumpkin soup with apple mostarda, duck confit ravioli with Provençal black olive oil. It wasn’t too thick as it may sound. You’re presented with a bowl with the ravioli in the middle, then they pour the soup around it table side. The problem it, the soup wasn’t hot. I think it must have cooled from the delivery system, kettle to pourer, pourer to bowl. It was velvety with clean flavors, but I believe it was meant to be served hot. We also had the terrine of Long Island duck and fois gras served with truffled mushrooms, pistachios, frisée salad with quail egg, mustard crème fraiche, and toast points. The terrine was enough for two to share as an appetizer. You could easily cut the bacon wrapped terrine with a fork. The mustard crème fraiche wasn’t mustardy, it was just right. I think too much mustard flavor would have thrown off the flavor combinations. The frisée salad with quail egg was delicately dressed. The truffled mushrooms were very tender and a treat on the side. For entrées we tried the smoked Berkshire pork loin with sautéed spinach and crispy polenta with what seemed to be small pieces of potato in it. The pork loin was smoked which left it pink and delicious. Though, not so much of a usual pork loin taste as it was like smoked ham. The other entrée we tried was the risotto. Oh my goodness! One of the very best risottos I’ve ever had. It was perfectly creamy, but not mushy. Each grain of rice was identifiable without being underdone. In the risotto were mushrooms and a good taste of what I’m guessing is Parmesan. It was topped with chucks of local squash, cooked perfectly. I highly recommend this meal. I don’t remember the exact ingredients in addition to the ones I’ve mentioned. I’ll have to call the restaurant to give me their description. The risotto alone made the trip to the north fork worth it. For dessert we ordered the pear crépes and homemade donuts (actually donut holes). The pear crépes were fair to good. The sugar and spice, warm donuts come right out of the fryer to order. We tried one sinful bite and packed the rest to have for breakfast this morning. The hostess learned it was my birthday and the crépes came out with a candied “Happy Birthday” sign, which I thought was cute. Then she came over with a stack of packaged chocolate chip cookies for my birthday present. Then, she came by with another package of donuts and said that was for tolerating the screaming child in the dining room. All-in-all it was a wonderful evening and a culinary treat. I highly recommend going.